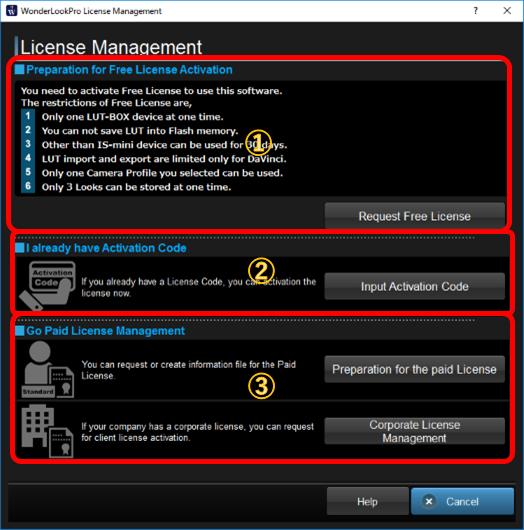 Following steps explain what you should do to activate Free License just after you installed the software and run it for the first time. If you are going to get Free License, please cliock "Request Free License" button. Next step explanation is here. If you already purchased the paid license, you can go to next step for the activation. If you are going to purchase paid license, please click "Preparation for the paid License". If you are going to activate Corporate License Client, please click "Corporate License Managment". Copyright © 2016 by WOWOW Entertainment, Inc., All Rights Reserved.